Last night 25 people gathered in a downtown pub in a market town in the East Anglian borderlands. It was Tuesday night and raining cats and dogs and the pub was almost empty. The backroom however was full: heads were craning forwards to tune into the mood of the moment. The big cuts were about to be announced (at 12.30pm today) and the Sustainable Bungay sub-group on Economics and Livelihoods was about to be launched. 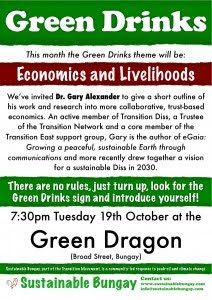 “We need to learn skills with working together, said Gary Alexander who had been invited to share insights about visioning a sustainable community outlined in his booklet, Sustainable Diss. Here is the Good News, he said and outlined what the town c.2030 had achieved and how people only got into exchange and relocalisation when they had no other choice. When we discussed our imminent future we were sharing the Bad News. Wheat will go from £150 to £700 a tonne in 10 years, said Glenn, a farm manager, and filled us in on how tractors now use more fuel, so that carbon emissions can be reduced. David told us from his experience in Africa how it takes two years to reskill a community to do small-scale farming. Cathy “in the spirit of the gift economy” brought some chard from her garden to share. “Are you coming to our Apple lunch?” asked Netta from Sustainable Beccles. “If the exhaust hasn’t fallen off the car!” I laughed, and thought about the cost of petrol and how hard it’s getting to travel from place to place. It’s difficult to see how we can effect change in our economic structure, not just because we lack financial or political power, but because we have been distracted for aeons from looking at the truth of the matter. We prefer ideas to reality. We like to handle facts as if they are our property and preside over them like CEOs. The fact is we are small and the iceberg that looms before us is large and invisible and the best response I can think of right now is what I was doing one hour earlier in Josiah and Elinor’s kitchen, mapping out our Transition workshop alongside Iris (almost one) eating a biscuit, playing swords with Reuben and Tristram, and chopping up some (local organic) veg for dinner. It’s cold outside, but in the kitchen it felt good. We were all in Transition together, and that counts in ways you can’t evaluate on any form. The pub was warm too, but disquieted. “490,000 public sector jobs are going to be axed,” said Josiah by the bar as he invited us to debate the issues around small wooden tables. What were we going to do as a community to build an infrastructure, to give each other a hand, to start up small enterprises within a hostile atmosphere? The problem with this case is not its premise, but its position. We are used to seeing the bigger picture from the outside with our minds rather than from within the situation with our actions. You, stupid human, what a mess you have made! You wrong people need to do this and that. Change your behaviour! Shift that consciousness! No matter how intelligent or visionary or noble our words, we remain above the situation. We’re not in the thick of it, saying how it feels, speaking as one of those stupid humans who have been trained to think that how we live is normal and OK and “civilised”. We’re not seeing that when our assumptions are challenged we either start commanding the idea of reality (“Pepsi and ASDA now say our agriculture is unsustainable”) or start inventing happy endings for ourselves. Somewhere in our scaredy-cat minds, we’re thinking . . . any minute now the cavalry will come and I’ll be rescued. I’ll win the lottery. Someone I don’t know will sponsor me, pay for me, let me off the hook. I’m thinking one day I’ll be able to go back to America, to Mexico, my books will sell, I’ll wake up one morning and my bones won’t creak anymore. One day everything will be all right. And even though the world is crashing around our ears and I know my agent won’t call and I’ll never be able to fly or put my legs over my head again like Iris, I’m holding out somewhere. We all are. And that somewhere isn’t here in the room. This is it. We are the people we are waiting for. When I woke up with this morning I realised. Those Titanic thoughts have to go, or we won’t make the lifeboat. Gotta get real. ← All new Green Drinks! !